The holidays are coming soon, and even if we're all tightening belts this year, chances are there's a few gifts you and your readers are going to need to buy, and you'll probably be buying some of them online. The online Mall at iGive.com features over 700 trusted online retailers like Lands' End, Staples, NORDSTROM, JCPenney, eBay, Expedia.com, Barnes & Noble, QVC, & PETsMART to name just a few, who've agreed to donate a portion of iGive member purchases to good causes the members choose. You'll NEVER pay more when you reach these stores through iGive.com, in fact if you take advantage of the many coupons and free shipping deals available to iGive members, you might even save a few bucks! At Life in Africa, we're using iGive.com to raise money for the school fees need in Uganda that I wrote about in my blog post of 29 October. When you (and hopefully your readers) sign up at iGive to support Life in Africa, part of your purchases on Christmas gifts, office supplies, computer software or whatever else you plan to buy anyway can help send Ugandan kids to school. Make a purchase within the first 45 days of sign up, and iGive will even donate an extra $5 to the cause. They've also got a new Yahoo! powered search engine that you and your readers can use to earn school fees for Ugandan kids with every search. Well, but you know how the internet works. It could be cool... if only enough people would actually sign up and use the iGive service to channel their favorite merchants' generosity our way. If you have a blog, that's where you and this chALLEnGe come in! I'm challenging you to a creative blog contest that helps me get the word out, by writing a post on your blog that encourages your readers to sign up for iGive to support Life in Africa through their holiday shopping and/or searching online for the rest of this year. All qualified submissions will be voted on in an online poll to be held December 1-3 at ned.com - a cool online community where lots of Life in Africa members and supporters hang out. You and your readers can join and vote too. See below for further details on how to make sure your post qualifies. 1. Participating in this challenge is going to expand your creative range as a blogger and expose your blog to new audiences. 2. Even if you don't win, you will have the gratification of knowing you helped to fulfill very real needs in the lives of others: these war-affected Ugandan families really need help with the costs of educating their children and the orphans in their care, and a fellow blogger you know with limited connectivity (that would be me!) really needs your help to help them. 3. If you win in the online reader poll, there will be prizes - I've tried to make these special so you'll put your heart into this! 1 dozen free Jungle Bead bracelets for you to keep or give away as unique holiday gifts. 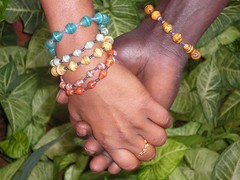 Jungle beads are made from recycled magazines and cereal boxes by the Life in Africa women in Uganda whose families you will have helped by participating in this chALLEnGe. The beads are waterproof and really gorgeous! 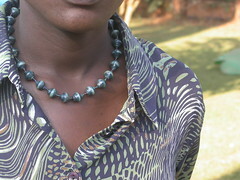 A free 16" single Jungle Vine necklace made from recycled paper by the Life in Africa women in Uganda whose families you will have helped by participating in this chALLEnGe. 4. Post the link to your completed submission in a comment to this post by no later than November 30, 2008. (This is a do-follow blog by the way, so your link in a comment here will be counted by the search engines). 5. Sign up for a free account at the Ned.com community and wait for December 1 to vote in the online poll. So then I thought maybe a drawing would do, but that would mean that someone who put a lot of effort into this chALLEnGe would only have as much chance to win as someone who just posted a sentence or two. What I'm excited to see (and will ask readers & LiA supporters to vote on) is your blogger's creativity in telling this community's story! I want to draw your attention especially to the video below (made by a Life in Africa supporter who visited us in 2007) that gives you a good picture of the level at which the families who will benefit from this effort survive. Most were forced to flee their homes because of the war in Northern Uganda, and resettle in the "Acholi Quarter" you see in the video, where quarry work is one of the very few income generating activities available. As you can see in the video, these families really really need some additional stability and opportunity in their lives. After months of consensus building, the adults who are members of Life in Africa (mostly women) have all agreed that getting help to educate the children in their care is the number one most urgent need that they all face. Please help me to help them. With your help I am hopeful we can make a meaningful impact on at least some of their situations. Thank you very much in advance on behalf of Life in Africa members in Kampala's Acholi Quarter for participating in this chALLEnGe. Here's to bloggers like me and YOU making good things happen in their world!